A "footpath" on a new development has been ridiculed on social media for its "utterly ridiculous" size. The footway, measuring about 40cm (just under 16 ins), was created at Walton Gate in Felixstowe, Suffolk. It attracted comments on a Facebook news page, with one person asking if was "one of things police make you walk along to check whether you're drunk". 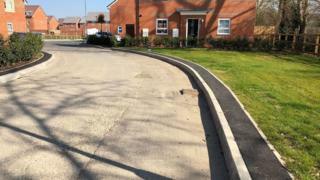 Barratt Homes said it was "not a footpath" but a "service margin" that was not intended for pedestrian use. Image caption Barratt Homes said the path was not a footpath but a "service margin"
A photo of the path was posted on the FelixstoweNews Facebook page with the hashtag #pathgate and the question: "When is a path not a path?" Ken Knights, who lives in the town and measured the "service margin", said: "You can't expect children and families and people with disabilities to mix with the traffic and the dustcarts. "On a new development that shouldn't happen." Image caption People joke whether the path was something "police make you walk along to see if you're drunk"
Replies included "what a waste" and someone saying it was "utterly ridiculous". One said it had put them off buying a house there because "we had to push our pushchair in the road". Others pointed out it was inaccessible for wheelchair users. A Barratt Homes spokeswoman said: "Service margins are installed for shared surface roads, where footpaths are not required in line with the Suffolk Design Guide for Residential Areas. "The majority of roads on site do incorporate footpaths." She said the roads at Walton Gate had been designed and built in line with Suffolk Highways Estate Road Specifications and had been approved by Suffolk Highways. The 190-property development, close to the A14 and Felixstowe Academy, was given planning permission in 2018. Suffolk Coastal District Council said it would investigate the matter to see if there had been "any breach of the approved plans". Are these the shortest double yellow lines in England?